in response to a reader's request, please see my Review for this product below. I bought this together with the Parure Powder foundation a month ago. so am i happy? or not? 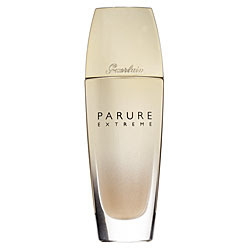 "Guerlain Parure Extreme Luminous Extreme Wear Foundation leaves the complexion glowing with a naturally matte finish. This Tibetan Rhodiola plant formulation helps cells withstand temperature variations, intense heat, and stress—making this product last for at least eight hours." i got the shade in 02: Beige Clair. i've read so many raves about this product in Makeupalley so i decided to get one for myself. it gives a matte, even, glowing look. i can't say if it keeps my oilies at bay since i'm on obagi and with 3 layers of cream (clear, exfoderm and sunfader" it's understandable if i get oily after a few hours. but what i really love about this foundation is that i look dewy and radiant and not as if i slapped my face with oil. i just blot 2x maximum and no retouching the whole day. the price? got it for Php2750, but it's from Guerlain..what do you expect? their color selection. the shade i got is the lightest, but because of its pinkish undertones, it tends to get a bit dark on me after some time. i flush easily and i'm a bit pinkish already so i think i'd prefer something with yellow undertones. i apply this with a stippling brush and then pat a bit more on my problem areas and undereyes using my fingers. others prefer to apply this using their fingers. now, to avoid getting too pink on me, i sometimes mix it with my MUFE HD liquid foundation in 117. or i just set it with a lighter shade of finishing powder. i have the powder foundation but i would look as if i went to the beach if i use it as a setting powder. looks and feels like a tinted moisturizer but the coverage is GREAT! 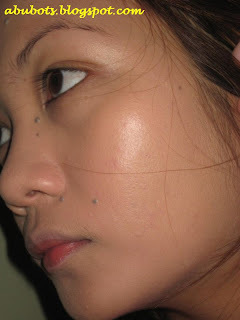 me wearing this foundation..no concealer! i'm sure this bottle will last a lifetime, but if they come up with shades with more yellow undertones... I SURELY WILL!